“Nothing went perfectly,” Bodin tells me with a smile as he describes his latest design project. 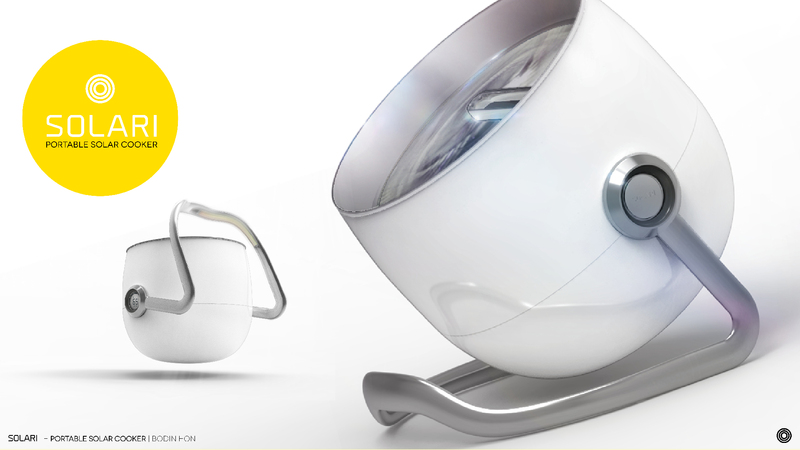 Looking at the Solari Portable Solar Cooker, a compact outdoor slow-cooker fueled completely by solar energy and winner of the international prize of the prestigious James Dyson award in Italy, you’d never think anything went less than smoothly during the process. Bodin Hon is a US-born engineer-turned-product designer who lived in Hong Kong prior to completing his bachelor’s degree at Rice University. He then went on to design complex systems for NASA and next moved to Milan, where he enrolled in the master course at IED, a premier design school based in Italy. The course, which is coordinated by instructors from Continuum’s Milan studio, encourages students to view innovation and design challenges through the three pillars of design thinking: people, business, and technology. Throughout the 12-month long program, students partner with real clients in need of innovation to solve problems; in Bodin’s case, an Italian cookware company had issued a design brief seeking a new product that would allow users to cook en plein air without using fuel or electricity. First, he considered people. Who would want to use this product, and how? Bodin and his classmates conducted research with 20 individuals in back yards, parks, at the beach, and on boats—moving from close proximity to a home or building with a power source out to more remote locations. From the beginning, Bodin was interested in designing a product that could work as far removed from energy sources as a boat on the water. Holistic thinking went into this work as well—part of the consideration of what new offering could make sense for this business involved thinking about popular cooking trends. In this case, the slow food movement, tendencies toward purchasing eco foods, and growing concerns about climate change all informed his thinking. From a host of design concepts including a bicycle-powered lunchbox and sous-vide pot, Bodin refined his idea to a crockpot style, solar powered cooker that would be easily portable and would leverage the greenhouse effect to trap heat and effectively cook food. From a sustainability angle, the product is primarily made out of aluminum, so it would last for years of continuous use and is completely recyclable. The technology leveraged to build the grill itself was fairly simple, and the feature of the handle which flips to function as an adjustable stand for orientating the cooker towards the sun and holder for a utensil was result of working with foam core prototypes in the field and observing the behavior and movements of users, without even thinking about it, prefer to use the stand to hold a serving spoon to prevent it from touching the ground. The more interesting technology story is that, as Bodin researched solar cooking, he found large and enthusiastic online communities sharing tips and best practices about it, and was inspired to include a connectivity component on the cooker; during the course of the project, he taught himself user interface design and designed a complementary mobile app that lets users share recipes. 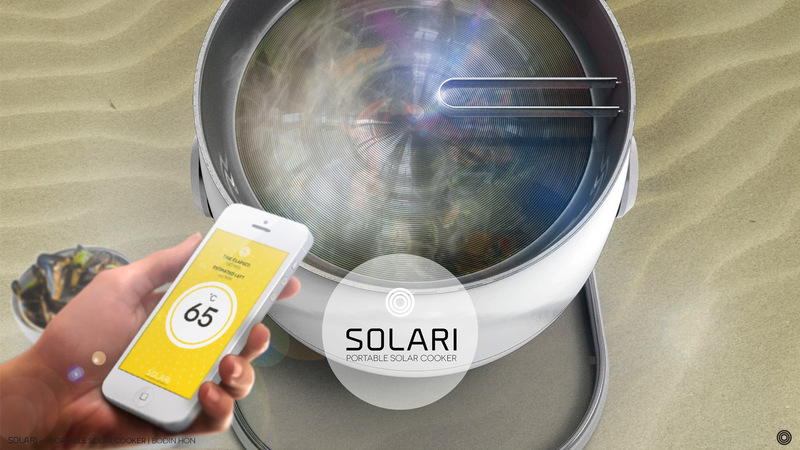 It also made sense to include a sensor on the grill that would allow transmission of the food’s cooking temperature to a smartphone, since judging cooking completion could be difficult for new solar chefs/cookers. So what didn’t go exactly according to plan? Bodin referenced components of the work that took him out of his comfort zone, including approaching Italian-speaking locals and interviewing them on their eating habits and getting their invaluable feedback on the design, more detailed sketching of his models, and an incident that involved burning plastic while thermo-forming a prototype. But what he has to show today is an award-winning product that was started and designed in a mere 2-month span during the program in the summer of 2013 and may be prototyped further by his client sponsor. What’s next? Bodin is especially interested to bring an affordable version of this cooker to emerging markets, where nearly 3 billion people use unclean firewood and biomass to cook in open fires, which causes air pollution and thereby health issues. He’s passionate about bringing clean cooking to these developing economies.